Are Neilson being modest about their ski numbers? TTG Digital recently carried a revealing interview with Richard Bowen-Doyle, chairman of Neilson Active Holidays since their management buy-out from Thomas Cook last year. Effectively, you’re selling the same thing as everyone else and all you end up doing is competing on price. Are Neilson being modest or Crystal being generous? What’s so surprising about this to us is that last year’s Crystal Industry Report suggests they carried 61,500 in 2012/13 down from 80,000 in 2009/10. Esprit/Total up to third place? We have previously suggested before that Crystal’s report can tend to tell a story that suits their own narrative. But we have always assumed they underestimate their competitor’s market share, rather than over-estimate it. 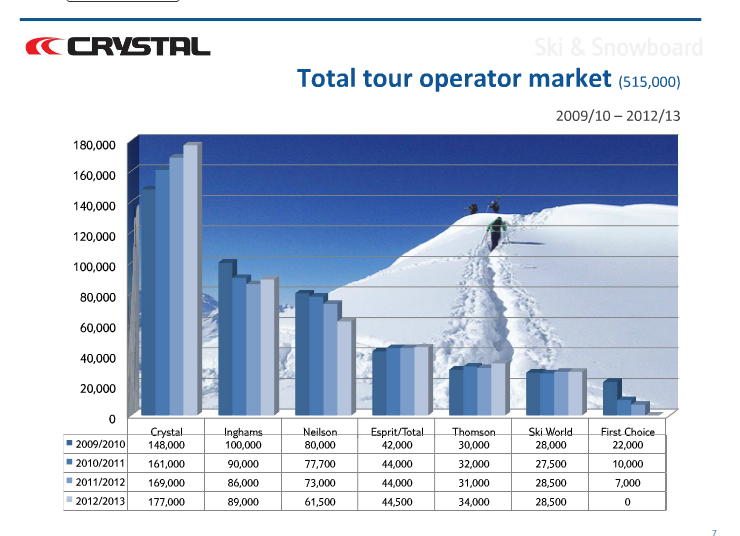 It will be interesting to see what the figures for 2013/14 are when the new Crystal Ski report is published next month. Based on this, and last season’s activity, we would expect Esprit/Total to replace Neilson as the 3rd largest ski tour operator in the UK.